Date: Apr 10 2019, 1 p.m. 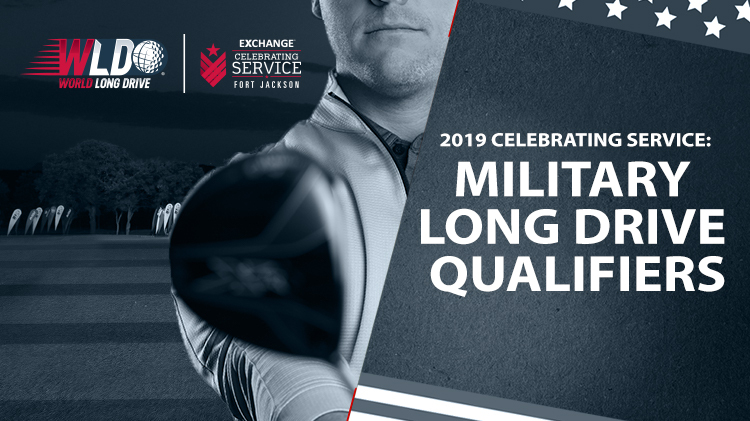 The 2019 Military Long Drive Championship is a long-drive qualifier competition sanctioned by World Long Drive Association. The qualifying event will be a one-day competition that will take place at 12 Army golf courses. The winners from each of the 12 installations will move on to Fort Jackson for the Military Long Drive Championship, a televised event (May 5-7). Eligibility: The MLDC is open to all active duty Service members (all branches), retired, Reserve and National/Coast Guard members at least 18 years old with valid DOD ID. Entry Fee: Competitors in the MLDC will pay $25 per attempt (eight balls). Contestants may compete more than once pending time availability. Active duty participants that compete in qualifying and championship events must do so on their personal time. The $25 entry fee purchases one attempt of eight drives. Participants may purchase additional attempts until the course closes the event. Each entrant will complete the eight drives back-to-back. Participants will use only USGA-approved drivers (maximum 48 inches long) during the event. All drives coming to rest within the grid will be recorded on the scoresheet. Drives exiting the grid will be graded at zero yardage. The longest drive recorded for the day is the winner of the qualifying round. A three-attempt tie breaker will determine the winner in case of a tie. Active duty participants must take regular leave to attend the championship event at Fort Jackson. 1st Place: $500 Pro Shop gift certificate + expense-paid trip to compete at MLDC, held May 5-7, 2019 at Fort Jackson. Travel and lodging coordinated and provided by the Golf Channel. The contestant (see Eligibility above) who hits the longest qualified drive during the MLDC in Fort Jackson will win $10,000 cash and be granted exemption into the Volvik World Long Drive Championship (Aug. 30-Sept. 4). Acceptance of the cash prize will result in the amateur losing his/her status as an amateur. Refer to the USGA guidelines for reinstatement of amateur status (USGA Rule 9-4). For more information visit: www.armymwr.com/WLD. $25 entry fee purchases one attempt of eight drives. Participants may purchase additional attempts until the Garrison closes the event. There are two ways to enter. Online or In-Person at the Golf Course up until the event.